"stunning and thought provoking performance"
"..an uplifting experience. This performance was beautiful and dynamic." Pause Listen Count was created with funding from Southern Trust in 2013. The film explores the body and our perspectives on disability and difference. Filmed by Rick Harvie, Belmont Productions it features Melissa Fox, Aleasha Seaward, Erica Viedma and Michael Leota. Still was created for the Christchurch Art Gallery in conjunction with the Ron Mueck exhibition. The work draws on the humanity inherent in the sculptures and we saw glimpses of our dancers. Stephen became the man in the boat. His experience of autism mirroring both the strength of spirit and uncertainty expressed. Woman carrying sticks became the inspiration for Parisa"s dance, the strength both to carry and to be carried and supported by others. Although the work was initially inspired by the work of Ron Mueck, it exists as a work in its own right and is a powerful exploration of the link between physical appearance and the human spirit: perceptions of difference, disability and connection. 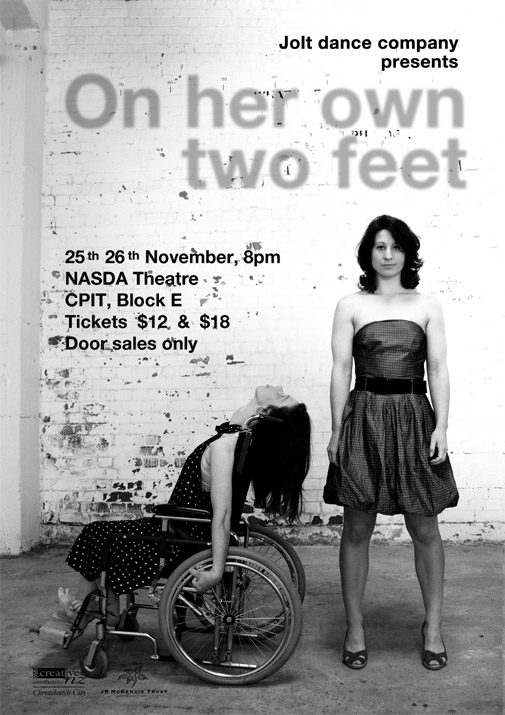 On Her Own Two Feet explored the textures and complexities of womanhood through the experiences of its individual dancers and asked the question "Does what we share in common as women overcome the physical differences that define us?" Sensual, sassy and strong it asked the question What does it mean to stand on your own two feet. "Let inside me Laugh" was created as an exploration of the experiences of two of our core dancers Stephen and Michael Krammer, both of whom have Autism. Using dance in combination with original film by Rick Harvie, the piece was a powerful and moving expression of both frustration and fragile beauty. Absolute was presented in three parts, each seeking to explore a different aspect of what it means to be human. "Absolute Trust" explored the unique bond between our dancers. "Absolutely Absurd" offered us a chance to laugh at ourselves. "Absolute" was about the need to be whole without the need to explain or justify yourself to the world. Crossing Point used film, dance and drama to powerfully portray some of the issues that surround having a child with downs syndrome. Based on the life of Jolt dancer, Amy Lysaght, it dramatically explored the pressures and expectations placed on us by society and how we need to break these by celebrating what is unique about all of us. "Tread Softly", our second show, presented a range of pieces that sought to celebrate dance: from the hauntingly beautiful to the theatrically comic. Based around favourite poems and music it explored movement and space. It also included live music written and performed by visually impaired pianist, Sean James. Jolt's first show was simply entitled "Jolt". 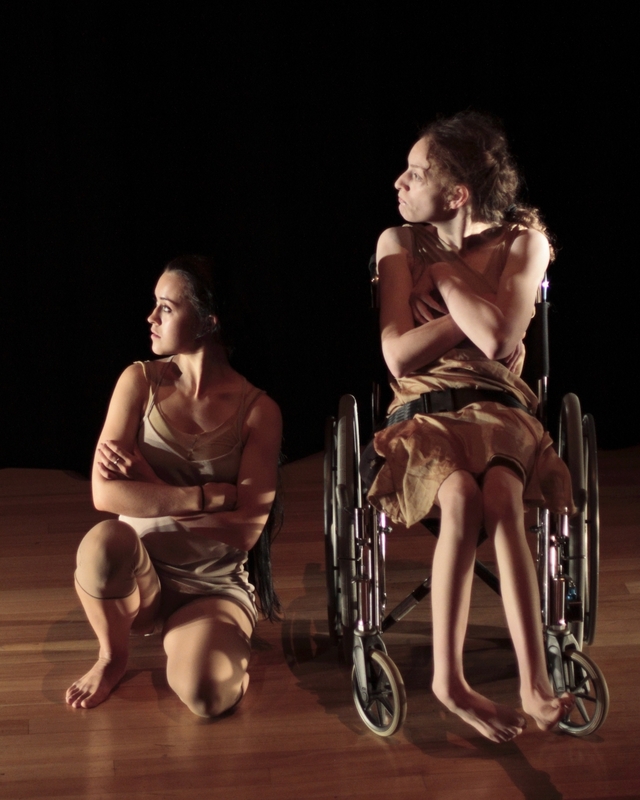 It brought together 8 young dancers of mixed ability to explore relationships: how we connect and respond to others and our need to overcome our own inhibitions about differences. Original generation time 1.0399 seconds. Cache Loaded in: 0.0245 seconds.